So, here it is! The reason things have been so awfully quiet around here lately. Ben and I marked our ten year wedding anniversary back in May, and we recently arrived home from our belated trip to celebrate the occasion. 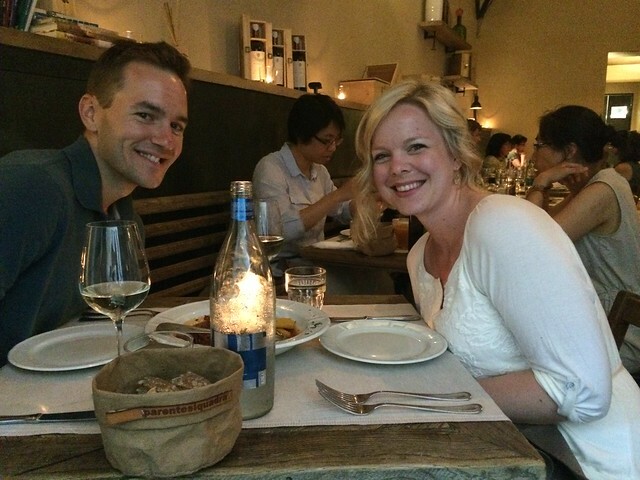 We love to travel and there are SO many places we are dying to visit, but we decided for our first European adventure we wanted to explore Italy. With such much to see in this amazing country and so many potential places to visit, it was tough to choose where we would stop during our limited time there. 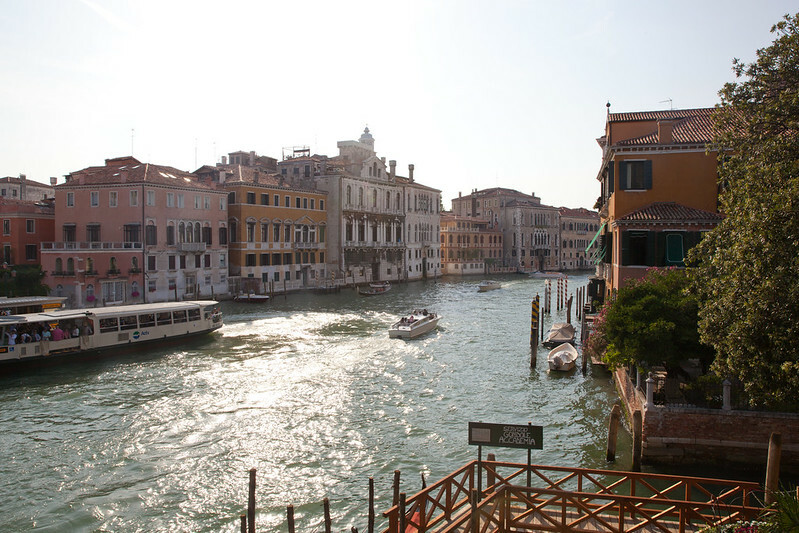 Eventually we settled on Venice, Florence, Rome and the Amalfi Coast. I’ll recap the highlights of Venice and Florence now, and discuss our time in Rome and Amalfi in a separate post. 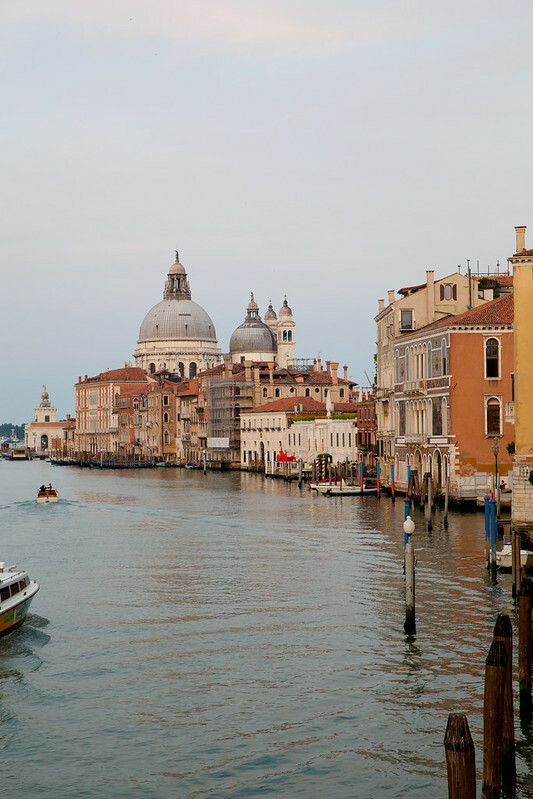 We started our trip by flying into Venice, and taking a private water taxi from the airport to our hotel. This was highly preferable to me than cramming onto a public water taxi and potentially getting dropped off far from where we needed to be (especially since we had no idea where we were going.) Though it was more expensive, I would recommend the private taxi if it is available to you. 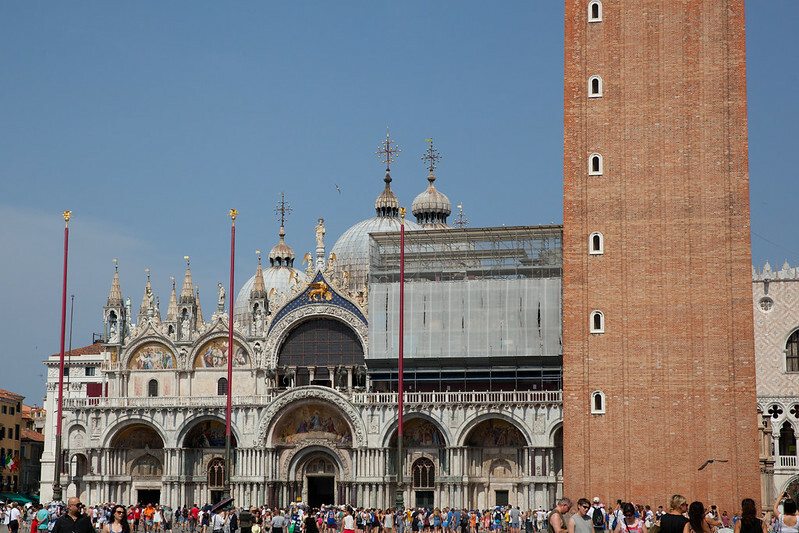 After arriving and getting settled, we headed out to see St. Mark’s Square and St. Mark’s Basilica. This should probably have been more interesting to me than it actually was, but I was kind of grumpy after traveling and the square was incredibly crowded. It would be great for someone who enjoys people watching but I mostly found it irritating. I think the preponderance of people both using and selling selfie sticks pushed me over the edge. (If I never see another selfie stick in my entire life, I would be thrilled.) In any case, we didn’t stick around for too long. Big church, very beautiful, moving on…. 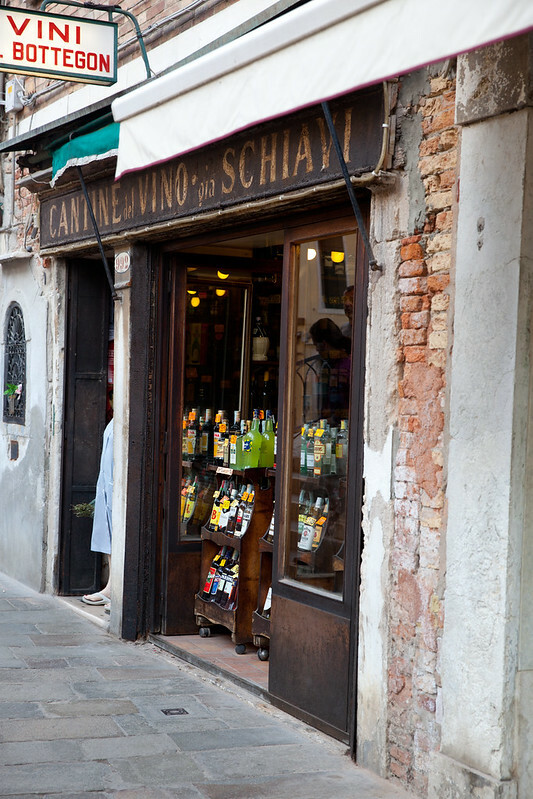 As someone who loves food, a trip to Italy is both exciting and a little bit stressful. I really, really didn’t want to get stuck in some tourist trap of a restaurant and waste a meal that could have been amazing and authentic. The amount of research I ended up doing for all of our meals was a bit exhausting but definitely worth it in the end. Of course, one of the best sources for recommendations are the locals! After reading a lot about food in Venice, I knew there were two things I really needed to try there – fresh seafood and cicchetti. 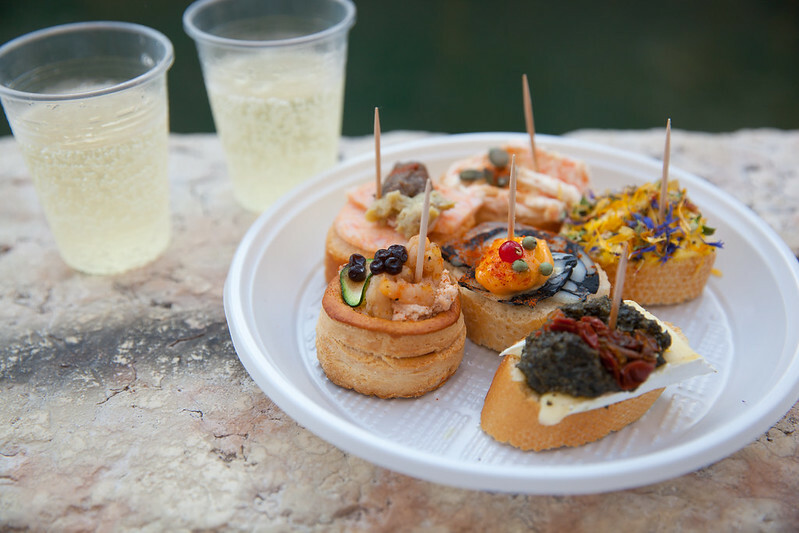 Cicchetti are small snacks, kind of the Venetian version of tapas. We asked a woman at our hotel for a recommendation for a good local cicchetti spot and she recommended Cantine Gia’ Schiavi (pictured above). We were so thankful for this awesome recommendation! This is a small wine bar with great cicchetti, both extremely beautiful and unbelievably tasty. The staff working when we visited didn’t really speak English but we were able to order mostly by pointing at what looked good. We don’t know all the details of what was on most of them since we couldn’t read the labels but every single one was delicious! 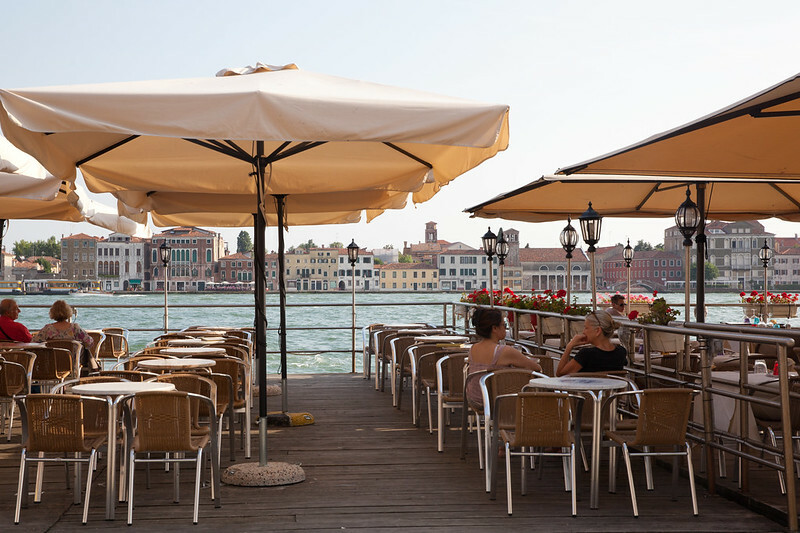 Cicchetti are typically eaten standing around the canal with a glass of wine, prosecco in our case. This was much more my speed than St. Mark’s square. We wandered around a bit more and relaxed in our room for awhile, and then eventually wandered over to the restaurant where we had dinner reservations. Again, I did a ton of research before choosing a restaurant to avoid getting sucked into some super touristy sidewalk restaurant with visual menus and mediocre food. The restaurant was a bit of a walk from our hotel, which we liked because wandering the streets is one of the best parts about a trip like this! I chose Impronta Cafe after reading reviews that described it as Italian food with a modern twist. We made a reservation but I don’t think we really needed one. Everything on the menu looked and sounded so good, it was really difficult to narrow down our selections! 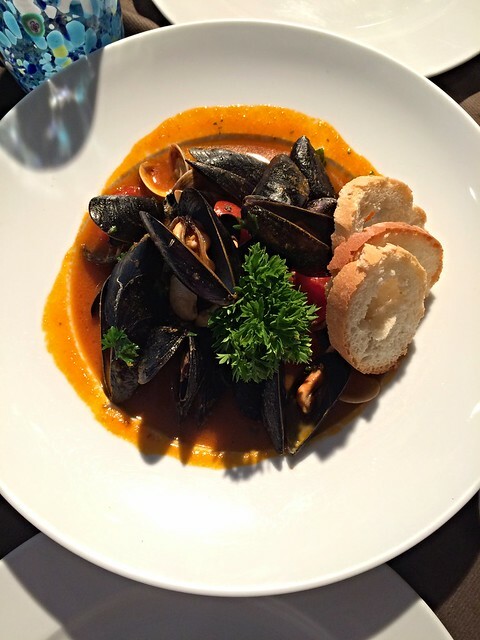 Eventually we settled on the mussels and clams with cherry tomatoes as our starter, and it was fantastic. I can’t remember the exact details of my entree but it was a special that evening, some sort of stuffed pasta with fresh cheese in a flavorful tomato based broth and it was also wonderful. We opted out of dessert, as we were planning the first of many stops for gelato. The service was excellent, very friendly and attentive. I would definitely recommend this restaurant. We only stayed in Venice for one night (loved our hotel, by the way) and the next morning, we walked over to the train station and moved on to Florence. 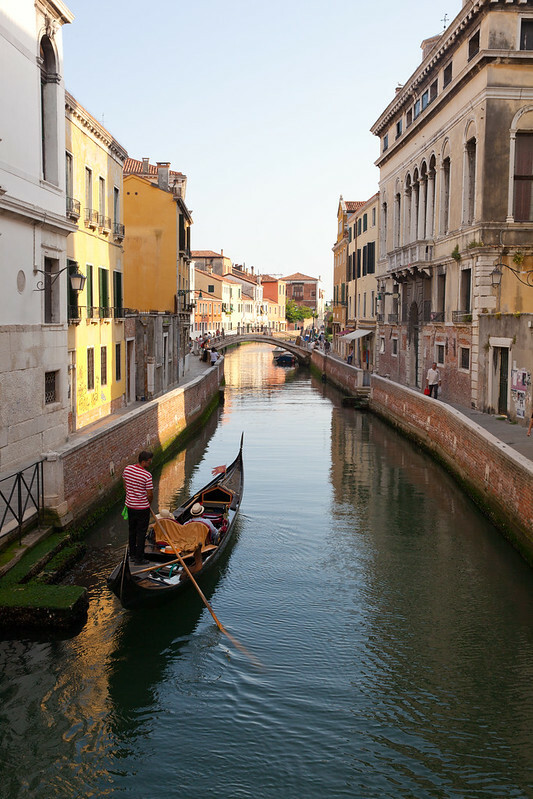 When initially planning this trip, we had allotted three days for Venice. 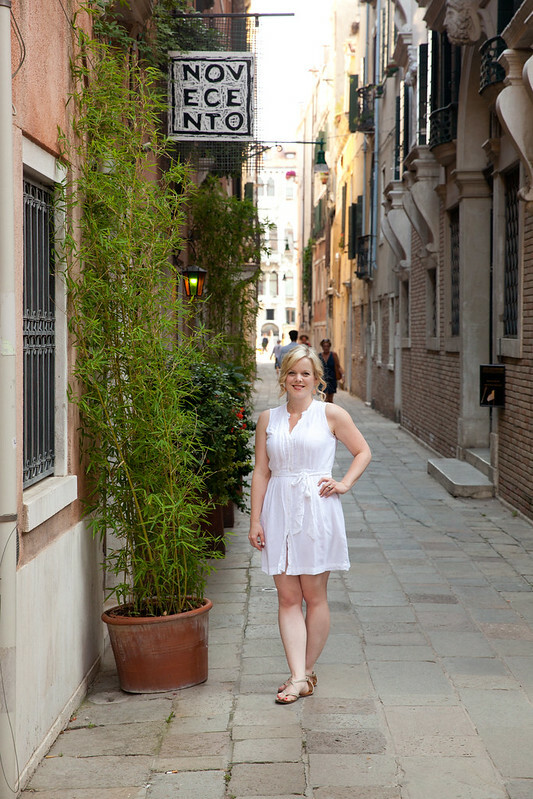 However, three different sets of friends all told me that they didn’t love Venice and that our time could be better spent somewhere else. Though Venice was beautiful and charming, overall I would have to agree with this assessment and I’m really glad that everyone gave me their honest opinions instead of us wasting our time. I’m glad I have seen it but I doubt I will go back and I wouldn’t spend much more than a day there. There are better places to spend time, in my opinion. We took the train from Venice to Florence and because we bought our tickets a little bit late, the only thing available was first class. Well, that totally spoiled me and we ended up going that route for the rest of our travels as well. After walking all over and being constantly covered in sweat, that first class treatment felt pretty dang good. It was another hot and sweaty walk from the train station to our hotel in Florence, but we were so thrilled when we were able to check in. It was really a beautiful and extremely comfortable room. Also, the location of this hotel was fantastic. 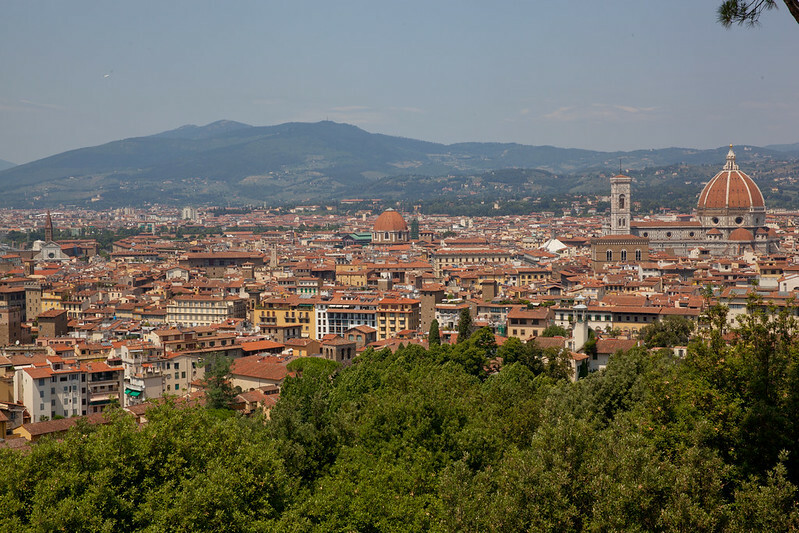 Florence is an easily walkable city in general but the central location of this place was especially perfect! 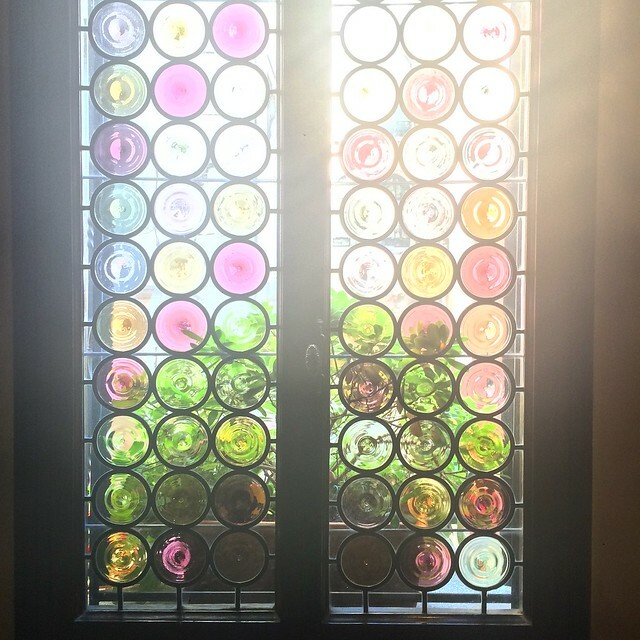 I can’t say enough good things about this hotel (Firenze Number Nine) – I highly recommend it and we will stay there again if/when we return to Florence! We didn’t eat dinner in their restaurant but we did enjoy happy hour and breakfast there, and both were excellent. Funnily enough, my friend Joanne had just travelled around Italy the week before we went, so she had quite a few good recommendations for me. One of her very best recs, and one of the highlights of the whole trip for me, was Mercato Centrale. It was the first place we went in Florence and honestly, I could have stayed there all day! The entire first floor is full of shop after shop after amazing shop with incredible produce, cheeses, meat, fresh seafood (including a gigantic swordfish head we saw in one shop – it was quite a sight! ), wine, spices, and more. The shops seemed to go on forever! We wandered for a while but I think we only saw a fraction of them. The second floor is a lot of different themed restaurants, very similar to Eataly in NYC or Chicago (in fact, I’m pretty sure they do have some affiliation with Eataly though I don’t know the details.) The moment I saw that there was a truffle restaurant (a truffle restaurant, people!) we were sold. 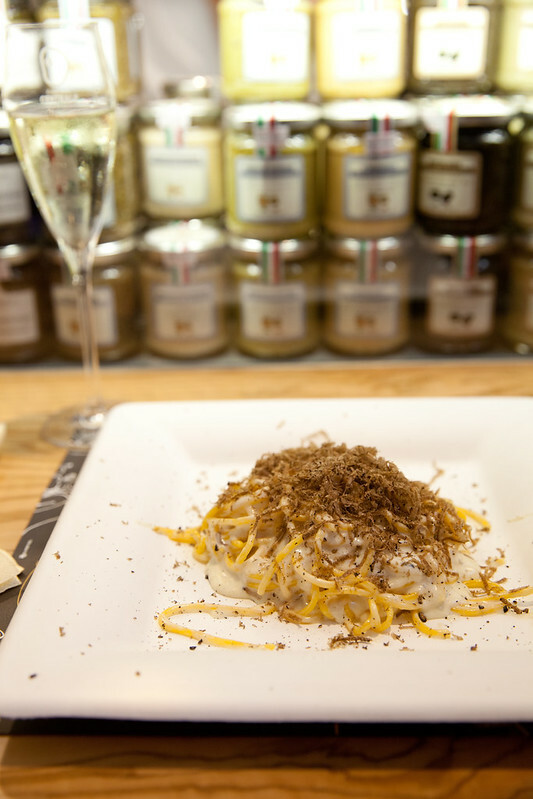 I opted for the pasta with truffle cream sauce and shaved truffle on top, again with more prosecco. This was absolutely phenomenal! Also, sitting at their counter and smelling so many truffles – it was quite literally a mouth watering experience. I was continually amazed throughout our trip by the abundance of truffles everywhere and their relative cheapness compared to here in the US. You better believe I took full advantage! 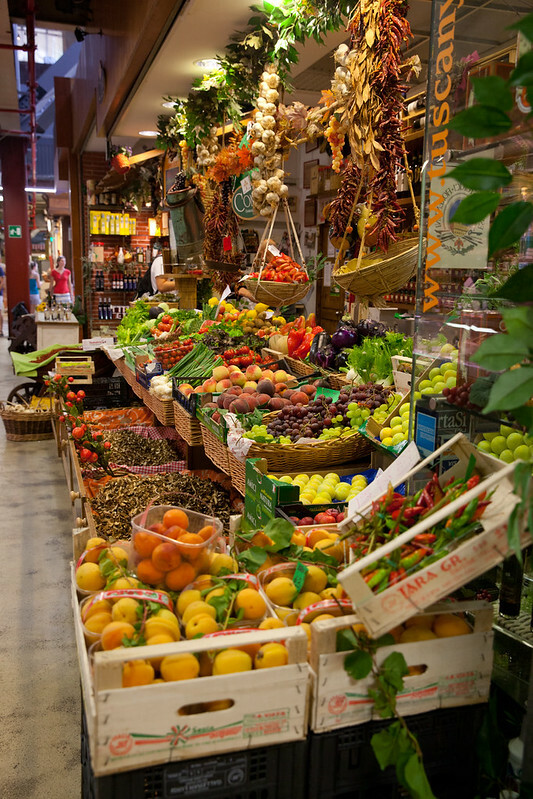 If you go to Florence, do not miss the central market! In fact, make it a goal to visit every day. We walked up and down this street many times a day, as our hotel is just at the end behind me in the photo. Had a grab a photo there. 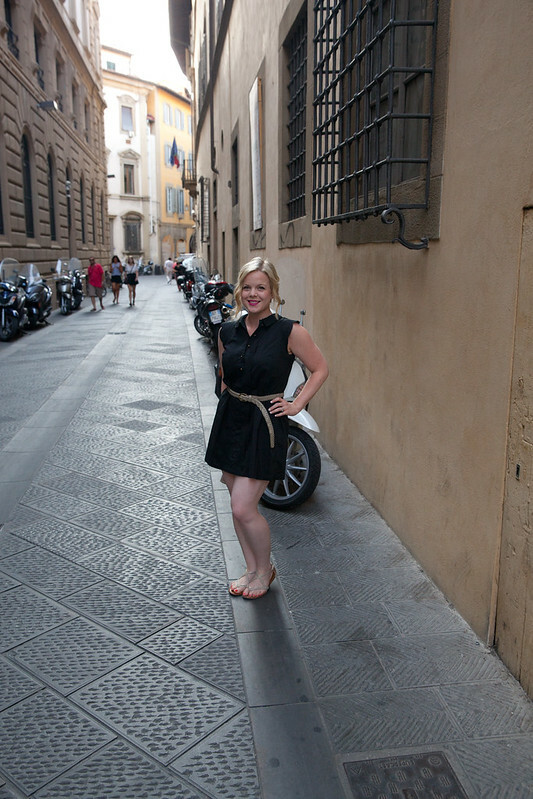 Even the streets are pretty in Florence! 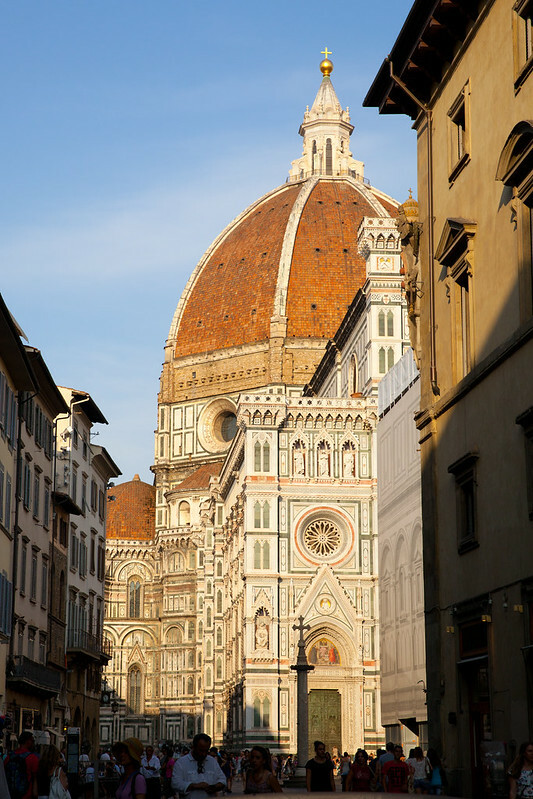 One of our favorite things about our hotel, other than the central location, was that each time we walked up the street and turned the corner, we were greeted by the sight above – the Duomo cathedral. 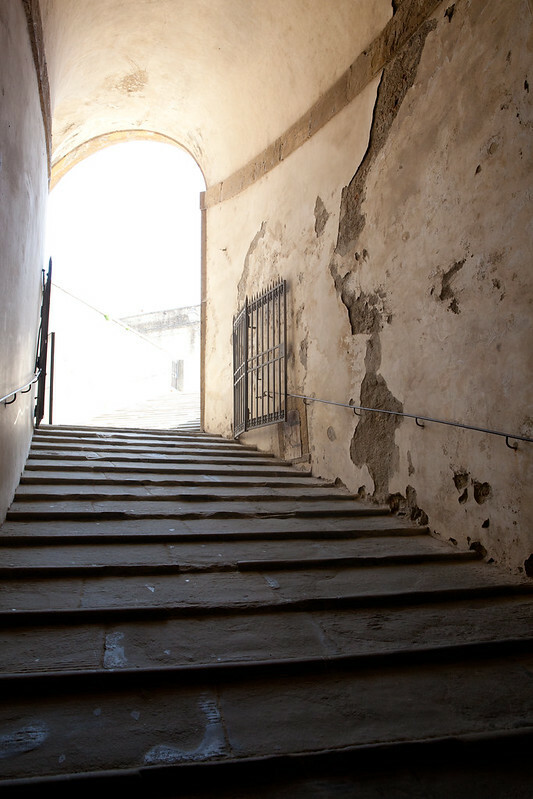 You can go inside and can also climb to the top of the tower for some amazing views of Florence, but this ranked below other priorities on our list and we ended up just admiring its beauty from the outside. It was truly breathtaking and every time we turned the corner, we couldn’t help but be amazed. 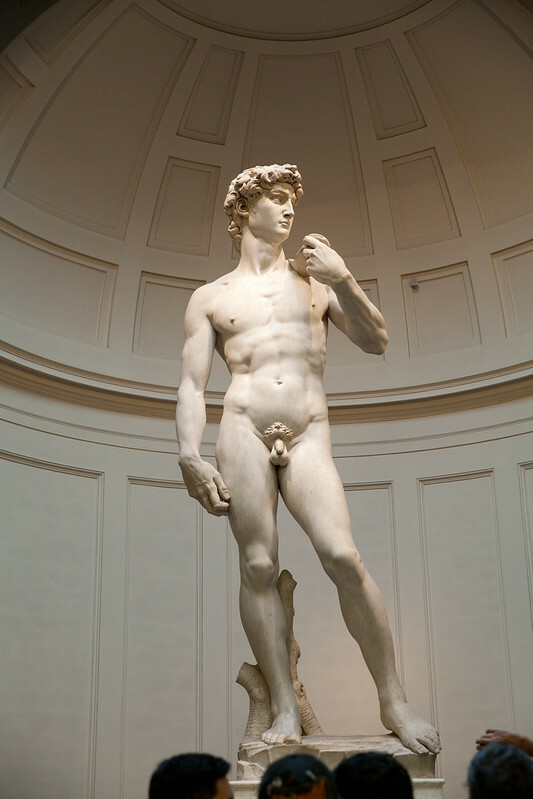 And let me mention a brief note about price of admission and avoiding lines – if you are planning to visit the main highlights including museums and such, I highly recommend purchasing a Firenze card. 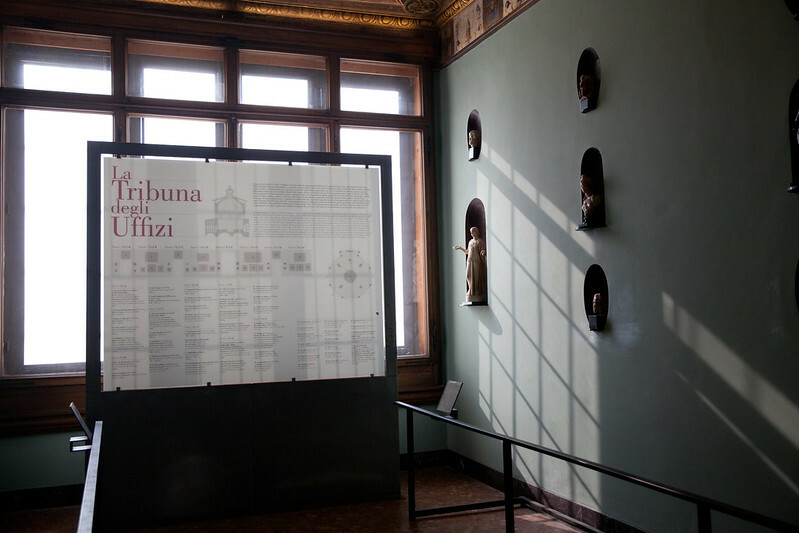 It gives you access to the main attractions for 72 hours and they have separate lines for people with the Firenze card which are much, much shorter than the lines for general admission (and often there was no line at all with the card.) It also gives you wi-fi access in all of the public squares which is a nice little perk, and use of buses which we didn’t need because we walked everywhere. The second morning in Florence, all of the travel and activity must have caught up with us because we slept in almost until lunchtime which is something we never do! 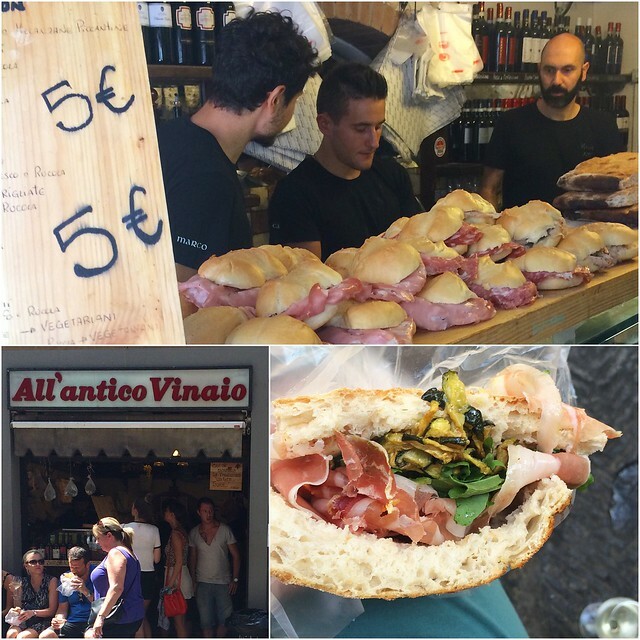 We were understandably hungry, so we took the recommendation of my friend Audra and headed off to All’antico Vinaio for amazing panini! I couldn’t decide what I wanted, so I just told the guy at the counter that I liked everything and let him add whatever combination of ingredients he liked. (This proved to be an excellent ordering method several times during the trip.) I ended up with sundried tomatoes, proscuitto, arugula, roasted veggies including zucchini and maybe also eggplant, and some kind of cheese sandwiched between perfect fresh focaccia. It was insanely good! There is really no place to sit and eat here except for a few chairs outside, so expect to eat this on the move or at least standing outside. We were able to snag some seats but I wouldn’t count on it – doesn’t matter though, these sandwiches are totally worth it! After lunch, we tried to visit the Uffizi gallery but the lines (even with the Firenze card) were crazy long so we decided to move on to something else. We walked across the river and up the hill to visit Pitti Palace. The palace itself wasn’t even on my radar but Ben suggested we check it out and it was actually really neat to explore. 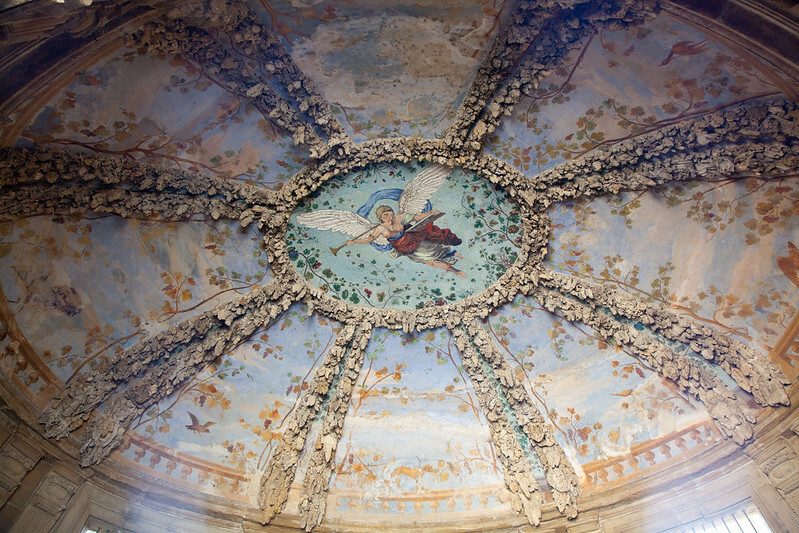 This gorgeous ceiling was inside a room just off the courtyard. So beautiful! These steps led up to the outside and the awesome gardens there. It’s a steep walk up to the top of the grounds, but worth it for some amazing views of the city from above! This would be a really cool thing to do in the evening to see the sunset and the city lights come on. I’ll definitely plan for that next time we visit, but it wasn’t in the cards this time around. Despite the midday heat and sun, it was still really awesome to see Florence from that vantage point. After our day of trekking around, we took a break at the hotel and then headed out for dinner. Again after reading copious reviews, we ended up eating at the restaurant literally across the street from our hotel, Konnubio. I was especially intrigued with their menu because it offered a lot of vegan options in addition to more traditional Italian fare. Though we didn’t end up ordering vegan dishes, it was refreshing to see some different offerings. We had the polenta with baby octopus starter, and I chose the squid ink pasta stuffed with swordfish and shrimp sauce for my entree. The whole meal was incredible! Also the wait staff was very friendly and attentive. I would definitely go there again! Instead of dessert at the restaurant, we walked around for a bit and then headed back over to Mercato Centrale for a sweet treat. 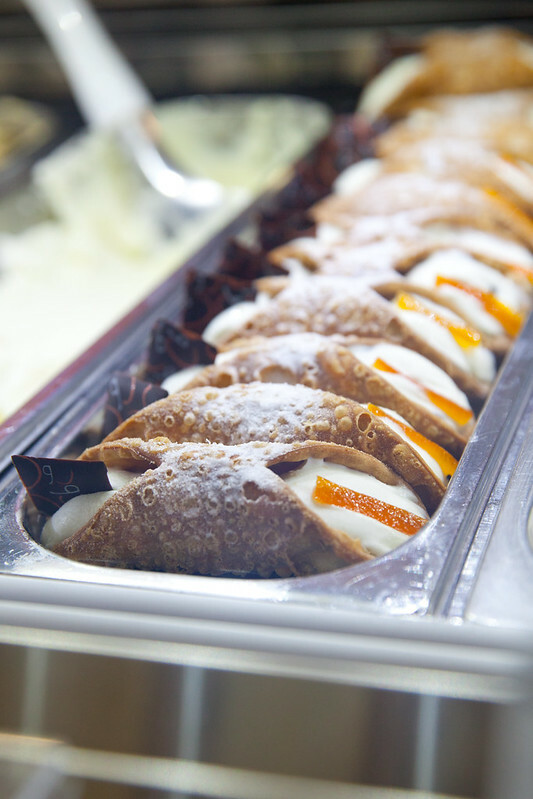 On our first visit I had spied these cannoli filled with vanilla ice cream and I knew I had to try one at some point. When we arrived at the building it appeared deserted from the outside, but the hours online said they were open until midnight. We tried going inside and discovered that while the first floor is shut down in the evening, the second floor is a happening place to be! It was full of people eating and mingling, and there was a band playing fun and lively music. It was just a wonderful atmosphere! I enjoyed my cannoli while we listened to the band and we ended up staying for quite a long time just taking it all in. This was another major highlight for me, both the cannoli (possibly the very best food I ate during the entire trip) and the fun nighttime market. Definitely check this out if you visit Florence! 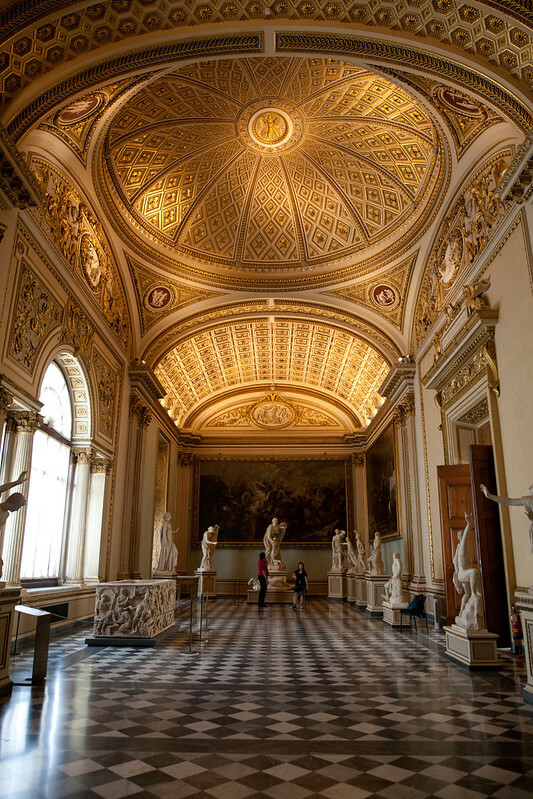 As it turned out, the third time was a charm for us attempting to visit the Uffizi Gallery the following morning. (We tried going back in the evening after Pitti Palace only to find that they had closed early for a staff meeting. Seriously!) Thankfully, it was worth the wait and the effort trying to get in. 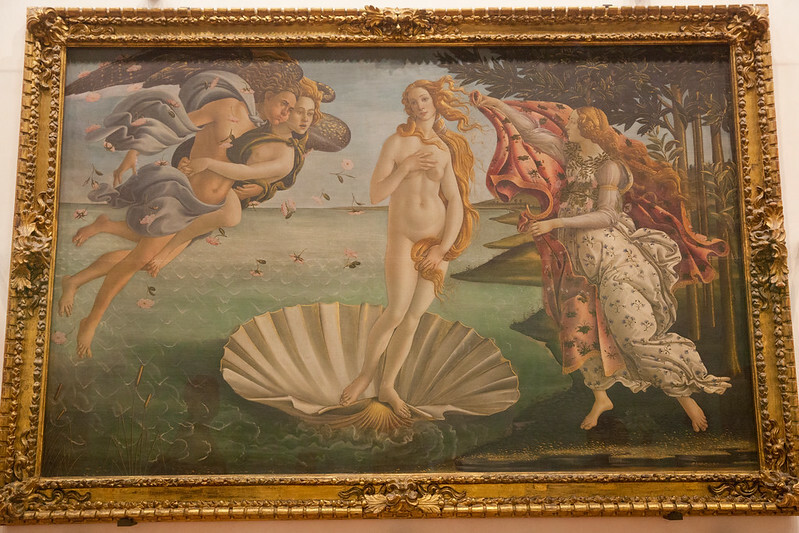 Probably the most famous works in the Uffizi Gallery are the Botticelli paintings, the infamous Birth of Venus as well as Primavera in particular, along with many other pieces from the Renaissance. It was truly amazing to get to see these in person after loving them from afar for many years. The gallery looked deceptively small to us outside and on maps, but inside it seemed to go on forever. We stayed for just a couple of hours because we were heading on to our next destination later that afternoon, but you could easily spend half a day here. The other thing that continued to amaze us throughout the gallery was that the building itself was an incredible work of art. So many rooms had unbelievably ornate detailing, domed ceilings, etc. This one was my absolute favorite. Truly gorgeous! After the gallery, we headed back to the hotel, packed up and walked over to the train station to move on to the next destination – Rome! More in a post next week about the second half of the trip. I’m sure there are things I have overlooked so feel free to ask any questions and I’ll update the post as necessary with more details!